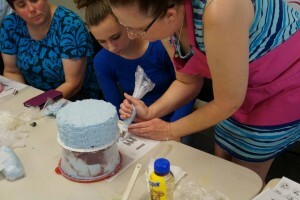 Baking Basics – This is our series of classes that teach cake decorating, sugar art and any other fun baking or decorating technique. These are designed for all skill levels. 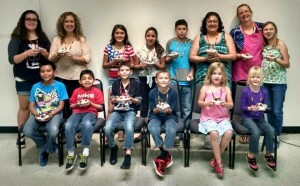 Birthday Cakes on Call – In under a day’s notice we have provided cakes to children having to celebrate their birthdays in the Diamond Childrens Center at the University of Arizona Medical Center, Tucson Medical Center, and Banner Thunderbird Childrens Center in Phoenix. Our expansion to other centers is all because of support from individuals like you!! To our knowledge we are the only organization that has this type of program (custom child’s cake in short notice). 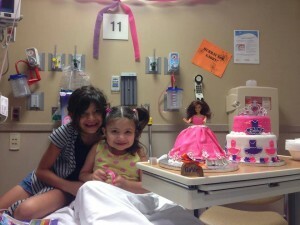 Children’s Rehabilitative Services – A quarterly event held for children at various Phoenix and Tucson area hospitals. 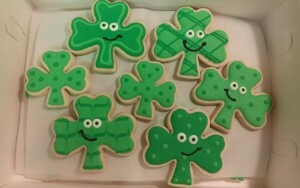 It’s meant to cheer them up with fun activities or holiday-themed events like St. Patrick’s Day. Operation Proud to Serve – Our way of saying “Thanks” to the military community. 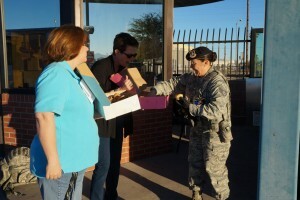 Quarterly Cakes for Causes travels the Air Guard base in Tucson to distribute sweet treats. Kids Club – A monthly program to teach kids fun decorating techniques. Hope Womens Center – A program in Phoenix to develop decorating skills for women at the center.